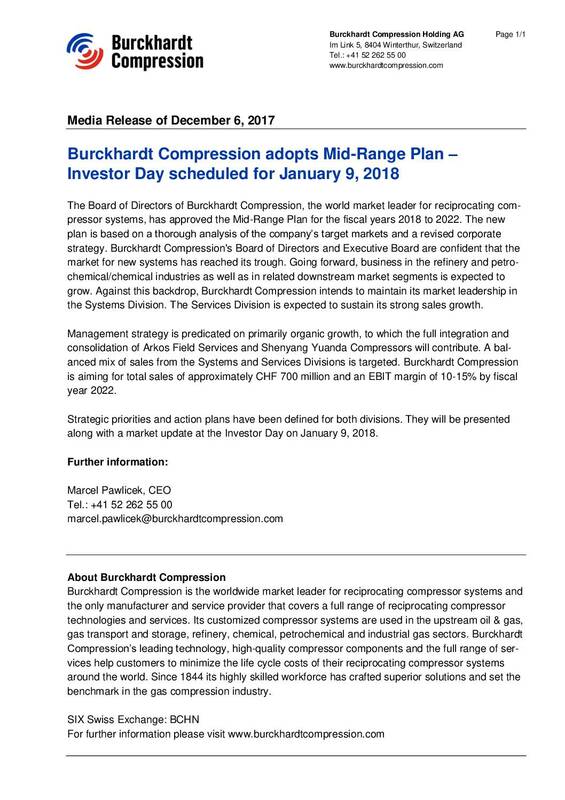 The Board of Directors of Burckhardt Compression, the world market leader for reciprocating compressor systems, has approved the Mid-Range Plan for the fiscal years 2018 to 2022. The new plan is based on a thorough analysis of the company’s target markets and a revised corporate strategy. Burckhardt Compression’s Board of Directors and Executive Board are confident that the market for new systems has reached its trough. Going forward, business in the refinery and petrochemical/chemical industries as well as in related downstream market segments is expected to grow. Against this backdrop, Burckhardt Compression intends to maintain its market leadership in the Systems Division. The Services Division is expected to sustain its strong sales growth. Management strategy is predicated on primarily organic growth, to which the full integration and consolidation of Arkos Field Services and Shenyang Yuanda Compressors will contribute. A balanced mix of sales from the Systems and Services Divisions is targeted. Burckhardt Compression is aiming for total sales of approximately CHF 700 million and an EBIT margin of 10-15% by fiscal year 2022. Strategic priorities and action plans have been defined for both divisions. They will be presented along with a market update at the Investor Day on January 9, 2018.